The surf rack from Famous Surf Supply was made by surfers for surfers. Shore up your boards with our unique 30" galvanized steel arms that stretch 10.5" wide and carry 100lb, hardware included. The rack can be mounted on a wall or ceiling and become a roof rack. The perfectly compact board storage solution. Your boards are protected with a layer of foam to prevent sliding and dents. 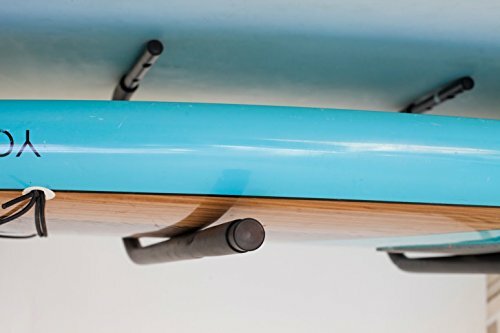 The two wide arms of the Famous Surf Supply surf rack allow for storage of SUPs/PADDLEBOARDS, wakeboards, surf boards, long boards and multiple smaller surf boards. Make it a wake surf rack. As well it is a great place to store snowboards and skis. We pride ourselves in the quality of our product and back that up with a 100% money-back guarantee. If you are unsatisfied for any reason, please reach out to us. Our story is your story and we built this product because it was something we needed. Everything we build at Famous Surf Supply solves a problem and we've been solving problems since 2003. Don't settle for less and make sure your Racks are famous. If you have any questions about this product by Famous Surf Supply, contact us by completing and submitting the form below. If you are looking for a specif part number, please include it with your message.